Did you know...as of 2016, Hungary ranks 8th in the world in medals at the Summer Olympic Games despite its being torn apart after WWI and losing half her population and 2/3 of her territory. This does not include an additional 6 medals won in the Winter Olympics nor the Hungarians that won medals as nationals of other countries after borders were redrawn or after large-scale emigration. member of the International Olympic Committee. The beginnings of the Olympic movement in Hungary go back further than the Games in Athens. Ferenc Kemeny, a great pacifist and member of the International Peace Bureau, was one of Pierre de Coubertin's first kindred spirits, with whom he struck up a friendship in the 1880's. Kemeny took an active part in the Congress for the re-establishment of the Games held in Paris in 1894 and was one of the founding members of the International Olympic Committee (IOC). Coubertin supported Kemeny's suggestion to hold the first Olympics in Budapest in 1896 in honor of Hungary's 1000 years of statehood. 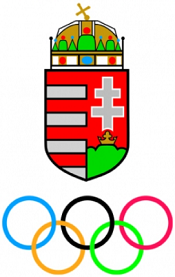 While the dream of hosting an Olympics is not yet realized, Hungary has won more Olympic medals than any other nation that has never hosted the Games. Please ask for permission and CITE this source, attributing Bryan Dawson, before using this information. All six of Hungary's medals at the Olympic Winter Games have been won in figure skating. In 1932 Emilia Rotter and Laszlo Szollas won their nation's first medal, bronze in the pairs event. Four years later in Garmisch-Partenkirchen, they repeated their bronze medal-winning performance. While there were a few 4th place finishes and exciting finals for athletes competing under the Hungarian Flag at the 2014 Sochi Winter Games, Hungarian-American Ted Ligety brought home Gold for the United States becoming the first American to win TWO Gold Medals in Alpine Skiing. Hockey Goalkeeper Shannon Szabados makes 27 saves to help Canada win surprise Gold over the USA to repeat her amazing 2010 Gold-medal-winning performance. 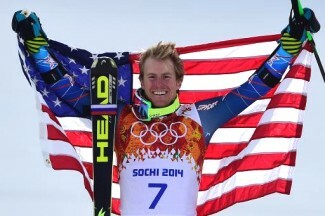 Ted Ligety Skiing - First Giant Slalom Gold for USA! His 2nd Gold! Known for pushing the boundaries of ski racing, Ted Ligety began skiing at age 2 in Park City Utah, and was racing by age 10 as a member of the Park City Ski Team. Ted’s early achievements included his first World Cup in 2003 and a slalom silver at the 2004 Junior World Championships. At age 18, Ted became a member of the U.S. Ski Team. He is the first American to win two Gold Medals in Olympic Alpine Skiing and first American to win Gold in the Giant Slalom. Ted won the Gold at the combined event at 2006 Olympics in Turin and the giant slalom race at 2014 Sochi Olympics. He is also President of SHRED Optics, a line of cutting-edge goggles, sunglasses, and helmets. Shannon Szabados - Two-time Olympic Gold Medal-Winning, Hockey Goalkeeping Phenom for Team Canada! Shannon was born on August 6, 1986 and started playing hockey when she was 5 years old. She has played men's hockey her entire career, with the exception of this season when she played full time with Canada's Women's Olympic Team. As a 15 year old, she lead the AMHL north division with a 2.45 GAA and 9.14 sav%. After posting stats like that against guys 2 years older, she was called by the Tri-City Americans of the Western Hockey League (WHL) and became the first and only female to play in the WHL and played her first game against the Vancouver Giants with Carey Price of the Montreal Canadians as her backup on the bench. She stopped 20 of 22 shots that game. She went on to play men's University hockey at Grant MacEwan where she led her team to the league finals in 2008 and was named her team's Most Valuable Player in 2009. After 18 years of playing men's hockey, she joined Team Canada to train for the 2010 Olympics where she did not disappoint. Shannon led Team Canada to a gold medal in what was quoted as "one of the greatest goaltending performances in the history of the women's game." She shut out the Americans 2-0 stopping all 28 shots. For her efforts, she was named to the Olympic All Star Team, and was also named the Olympic's Top Goaltender. In 2014 at Sochi, she made 27 saves to help Canada repeat their Gold Medal-winning performance!